Packet Pick-up: Friends and family members will be allowed to pick up for an athlete if they BRING a PHOTO COPY of the athletes ID and both SIGNED Waivers (see below). Without these 3 items we CANNOT release bibs. Sorry NO EXCEPTIONS. Waivers will be online & emailed the by the week of the race. Those under the age of 18 without an ID will need to have a parent/guardian be present to pick-up the race packet. Those under the age of 18 with an ID will need to have a parent/guardian sign the waiver to pick-up. For location and times see the Schedule. All half marathon and 10 miler participants must attend ONE packet pick-up (either Friday OR Saturday) unless they choose the mail back option. There is a $10 late fee for race day packet pick up! 5K participants are welcome to attend the expo to pick up their bibs, but it is not mandatory. If you are a 5K participant and you choose not to attend the expo, your bib will be available for you at the 5K start on race morning beginning 5:30 am. ID's are mandatory for bib pick-up. All Half Marathon and 10 Miler runners, skaters start at Sunset Park in Coronado and finish in Imperial Beach. Aid Stations: There will be 7 aid stations on the half marathon race course and 2 aid stations on the 5K course. The water stations are located approximately 1.5 miles apart. Water and energy drinks will be available at all 6 stations. Water is also available at both the start and finish areas. Skaters, Ellipticals/ElliptiGO, Hand Cycles and Wheelchairs: will only be permitted to do the 10 Miler. 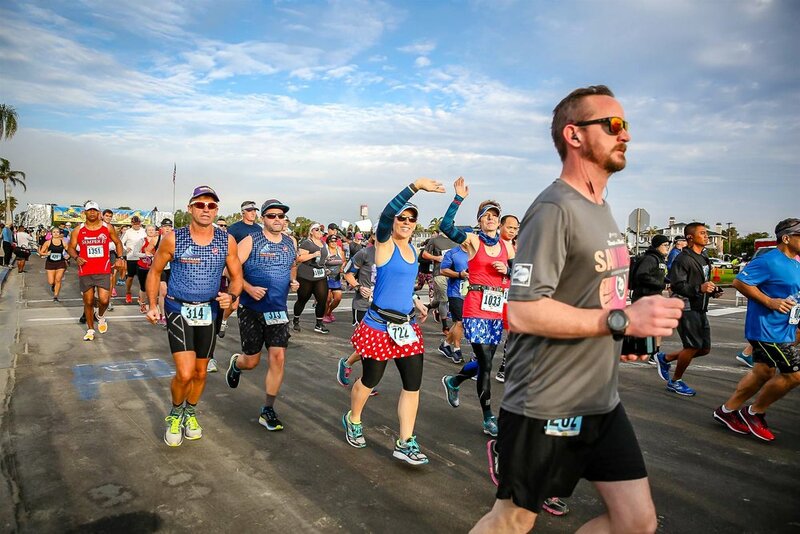 Both the Half Marathon and 10 mile courses start at Sunset Park in Coronado, CA and end at the Imperial Beach Pier Plaza, Imperial Beach, CA. Pace Teams: Road Runner Sports Pace Team- 1/2 Marathon pace groups include: 1:30, 1:40, 1:50, 2:00, 2:15, 2:30 and 2:45.